Mushrooms are the above ground, spore producing, fruiting bodies of fungi. Many of us consider the mushroom on our plate a minor player, an addition to the main course. Perhaps your childhood memories include the squishy gray lumps in the green bean and cream of mushroom soup casserole that mom served up for Thanksgiving. It is only recently that we have come to understand the value of fungi and their many talents - fighting cancer and viruses, enhancing immunity and restoring the environment. Mushrooms are a hot topic in the world of medical research and are gaining prominence as therapeutic agents. For the last 30 years researchers have been studying the anti-cancer, anti-viral, anti-fungal, anti-bacterial and immunity enhancing effects of many different species. Additionally, mushrooms play a vital role in bioremediation, used to clean oil spills and detoxify soils contaminated with PCB’s and other disease causing chemicals. Many, like the tasty, cancer fighting Shiitake and Oyster mushrooms show up on our dinner plates. Mushrooms can play a large part in detoxifying our bodies’ internal landscape, helping us to overcome disease. Fungi fight cancer! 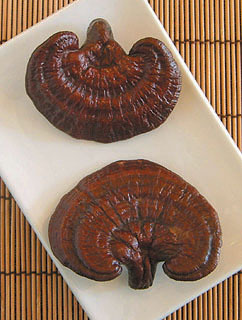 Medicinal mushrooms like Yun Zhi, Coriolus Versicolor (Turkey Tail) and Reshi, Ganoderma have been extensively studied. Polysaccharides contained within Yun zhi and Reshi enhance the bodies’ immune response to diseases like cancer. They have anti-tumor qualities which stimulate the bodies’ natural killer cells (NK cells), and activate macrophage activity. Natural killer cells are a type of white blood cell and part of our immune system. They contain enzymes which target and kill tumor cells. Macrophages, the bodies’ garbage cleansers, engulf and destroy foreign materials. Dong chong xia cao, Cordyceps another mushroom which grows on the bodies of dead ants, has been shown to reduce fatigue associated with radiation and chemotherapies. Dong chong xia cao also increases the bodies natural interferon levels. Interferon, a protein found in the body, fights cancer and infection. These factors help increase cancer survival rates by as much as 73% according to some studies. Adding mushrooms like Shiitake, Oyster, Maitake or Enokitake a few times per week to your diet is a flavorful means to enhance immunity and improve overall wellness. Nutrient-rich mushrooms are beneficial to people recovering from cancer or undergoing cancer therapies. “Gourmet” mushrooms are increasingly common in grocery stores and are very common, both fresh and dried in Asian food markets. Medicinal mushrooms are easily taken as a tinctures, in capsules or in teas. Many very good quality blends are now available to consumers through Chinese herbalists, health food stores, and via the internet. I always advise people seek out preservative free and organic herbal products whenever possible. Clearly, the mushroom is a mighty player and should not be overlooked in the fight against cancer and disease.